Attracts and captures mosquitoes and other biting insects like. Attracts and captures mosquitoes and other biting insects like Midges, black flies and no-see-ums. 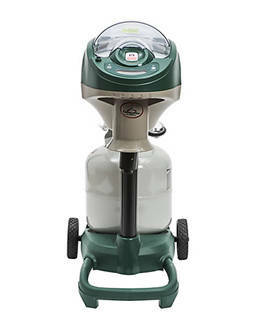 Features the Mosquito Magnet patented Catalytic Converter - converts propane into carbon dioxide (propane tank not included), heat, and moisture to simulate human breath. "Smart Technology" offers 5 different user-friendly digital setting options - including 4 fuel savings modes that extend the life of your propane tank. Can automatically start-up/power-down by itself when the temperature reading is above/below 50°F. The new rigid, self-contained included mosquito net has been especially engineered to maximize continuous, unblocked airflow. The new net allows for easy disposal, eliminating any interaction with insects.